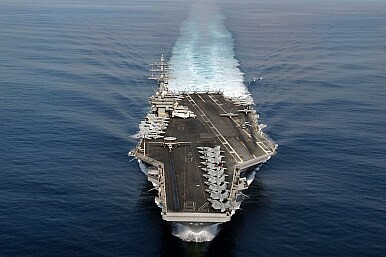 The United States’ Navy still faces a vibrant debate on the future of its aircraft carriers and supercarriers. Last Friday, Commander Bryan McGrath (USN, ret.) and Captain Jerry Hendrix (USN, ret.) debated the future cost-effectiveness of the nuclear supercarrier. The United States Naval Academy provided the venue, the midshipmen the audience. The debate shed some light on how the USN thinks about its aircraft carriers, and potentially portended the future of the aircraft carrier debate across the Indo-Pacific. Both McGrath and Hendrix have published extensively on military and naval affairs. McGrath was a national security advisor to the 2012 Romney campaign, and Hendrix currently heads the Defense Strategies and Assessments Program at CNAS. McGrath took a pro-supercarrier position, arguing that the USN’s large nuclear carriers provide unique military capability and symbolic import. Large carriers enable high sortie rates, and big decks give the USN flexibility with respect to the development of an air group. McGrath argued that long-range nuclear carriers will continue to remain the critical platform for projecting US military power, even as the constitution and responsibilities of the air group change. Hendrix was more circumspect with respect to the longevity of the carrier, noting that the United States is building ships in anticipation that they’ll serve for most of the 21st century, a virtually unprecedented run for a specific system in the modern era. Hendrix suggested that the roles played by carriers could be better filled by a combination of other ships and aircraft. Hendrix also noted the vulnerability of the modern carrier to anti-access/area denial systems. Both debaters invoked cost, although in different ways. Hendrix pointed out that carriers and their airgroups make up a huge proportion of the U.S. Navy’s outlays, crowding out other capabilities. McGrath took a different tack, suggesting that as the wealthiest country in the world, the United States can easily afford modern carriers, if it makes the correct trade-offs. While the debate highlighted the potential contribution of the aircraft carrier to securing U.S. interests in East Asia, it offered little in terms of evaluating the carrier programs currently under pursuit in China, India, and other IndoPac countries. In part, this is because the debate turned on the question of what kinds of carriers the United States needs, rather than on whether the USN needs carriers. Hendrix acknowledged the value of the USN’s light amphibious carriers, while McGrath focused on the capabilities of the larger Ford- and Nimitz-class ships. Still, some comparative context would have been helpful. Many of the navies of the IndoPac are splitting their attention between building carriers, and building the capabilities to kill carriers. Undoubtedly, some of these countries want carriers for some of the same reasons that the United States wants carriers. Thinking through U.S. interests in comparative context might have helped illuminate some thinking on how the USN should put together its own carrier fleet. Nevertheless, the debate demonstrated the value of open discussion regarding the future of the USN’s most important ships. Analysts in India, China, Japan, South Korea, and Australia would be well advised to pay close attention to how the USN understands the contribution of its aircraft carriers. What would a U.S. Navy without the F/A-18 Super Hornet look like?